The Viennese start-up GentleTent introduced the world’s first fully inflatable roof top tent, GT Roof. 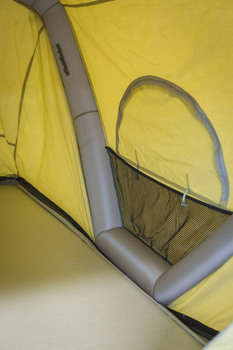 Requiring no fixed construction parts and accessible via a telescopic ladder, the base provides a 2.2m x 1.4m air mattress made of drop stitch material. 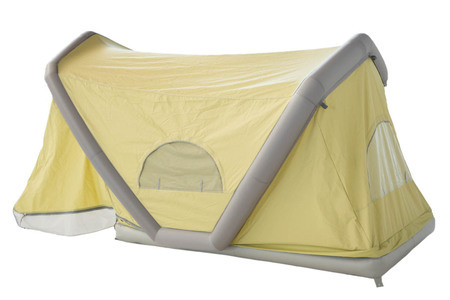 The tent itself is an air tent construction with an interior height of at least 1.3m. The GT Roof is mounted on the roof rack via a square frame, which allows adjusting of the overhanging of the tent to the rear or sideways. Due to its light weight of only 25kg and a pack size of 1m x 1m x 15cm, it is also possible to use the GT Roof on the ground or as a floating tent in the water. 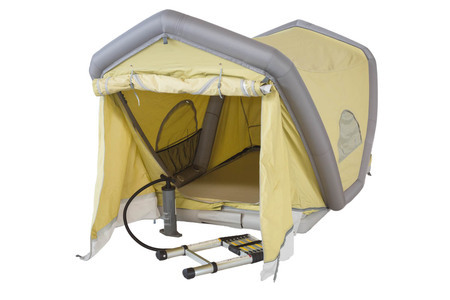 A fully inflatable roof top tent – and a great idea. This comfortable camping solution uses drop-stitch technology and traditional materials to make a very lightweight, comfortable construction.